Call it the girl-gang, the mod-squad, the cute crew, having your besties by your side at the most important times in your life is an unparalleled feeling. 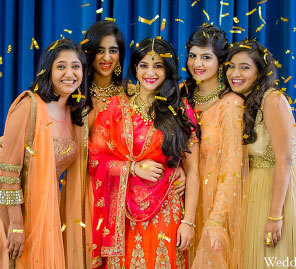 Bride-to-be Mansi Shah had always envisioned a fun pre-wedding shoot with her friends. 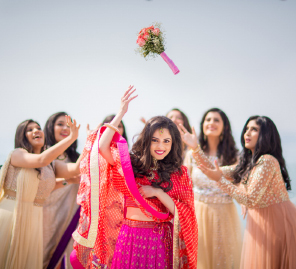 The minute she found out she was selected for the My Best Friend's Wedding photoshoot with WeddingSutra, she invited five of her best girls to make the most of this opportunity! 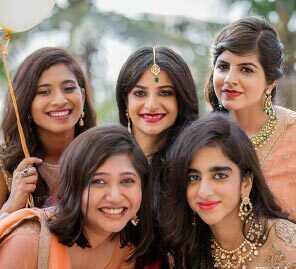 She’s been a tomboy all her life, so her friends Shruti, Drashti, Ishita, Nikita and Divya were really looking forward to seeing her all dolled up for a pre-wedding rehearsal with WeddingSutra’s curated list of wedding experts. The day started with the bride and her bridesmaids being invited to the beautiful suite of the luxurious JW Marriott Sahar, Mumbai. The contemporary interiors of the plush suite instantly wowed the ladies. “The rooms are so spacious and luxe; we already feel like princesses!” Mansi exclaimed. But there was more to come... the WeddingSutra team welcomed the girl squad with some exquisitely designed gift boxes from Payal Savla Designs which left them gleefully surprised! Happily trading tips and compliments, the bridesmaids, Shruti, Drashti, Ishita, Nikita and Divya chose pastel lehengas from Benzer. Mansi went with a stunning midnight blue velvet lehenga with intricate gold zardozi work and a striking pink dupatta, which not only gave a royal touch to her ensemble but was a gorgeous contrast with her bridesmaids’ choice of pastels. “I loved the Benzer lehenga because the cut and the color suited me. I also feel that the blue balanced the other pastel shades beautifully,” she said. Finally, it was the moment they’d all been waiting for… the photography session with Natasha Samant who helped put the girls at ease and also shared some handy tips on posing effectively for a bridal shoot. “We confess, we all were a bit conscious about the shoot but Natasha calmed us down. She was so friendly, happily chatting with us during the entire shoot that we didn’t even realize that she was actually shooting while conversing with us!” laughs the blushing bride-to-be. We at WeddingSutra enjoyed giving Mansi and her friends a memorable experience, and we wish them all the best! Photography-The Storyteller by Natasha Samant. Getting married in 2017? Would you like to be a part of My Best Friend’s Wedding Shoot? Write to us at editor@weddingsutra.comwith your name, link to your FB profile and wedding date. ...we’ve got a small favor to ask. 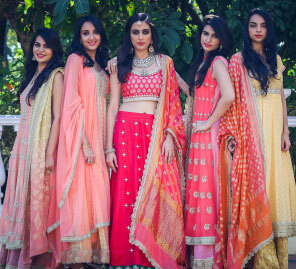 We know how much you love WeddingSutra's editorial shoots and how gorgeous are these photos! We want to continue doing more fabulous, editorial shoots, so if you love what you see, don't forget to follow/bookmark WeddingSutra's Favorites who have worked hard to helped us co-create this.